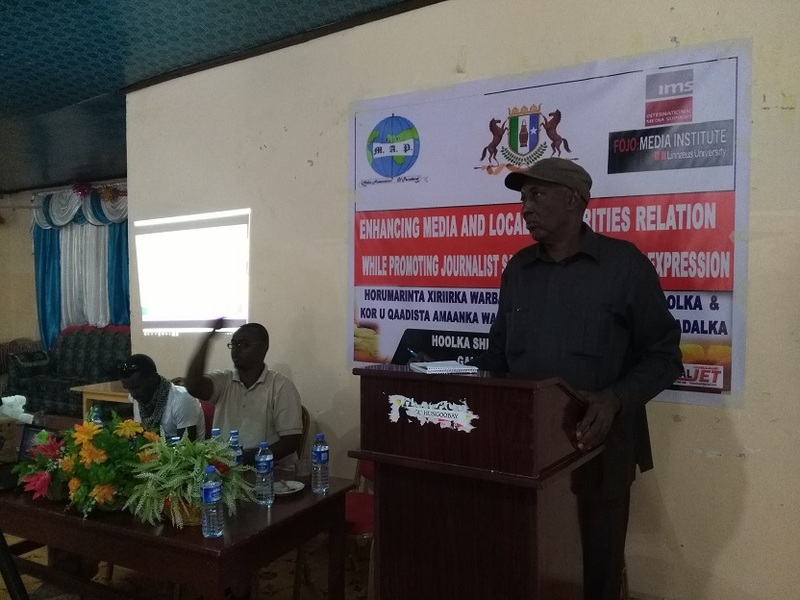 Home » Puntland: IMS & FOJO Supported ‘’Twin Advocacy Seminars on Freedom of Expression and Media practice in Puntland’’ augments the professional relations between security forces and local journalists. Puntland, 24th.01.17: International media support (IMS) and FOJO has supported the Media Association of Puntland (MAP) to carry out two separate advocacy workshops in Galkaio and Bosaso, Mudug and Bari region’s capitals of the Puntland state of Somalia with the intention to establish more professional relations between security forces and journalists, and to create an enabling environment for freedom of expression and Media practice in Puntland. 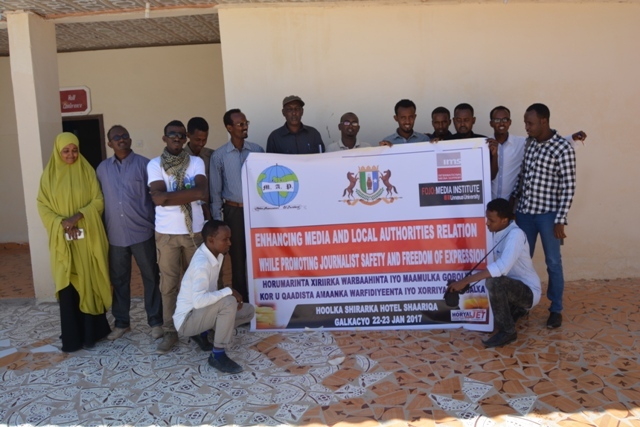 Participants were drawn from Media Managers, Regional authorities including Bari Region governor, Mudug Region Governor Regional Police commissioners, Seaport security commander, Airports Security commander and Town Mayors. 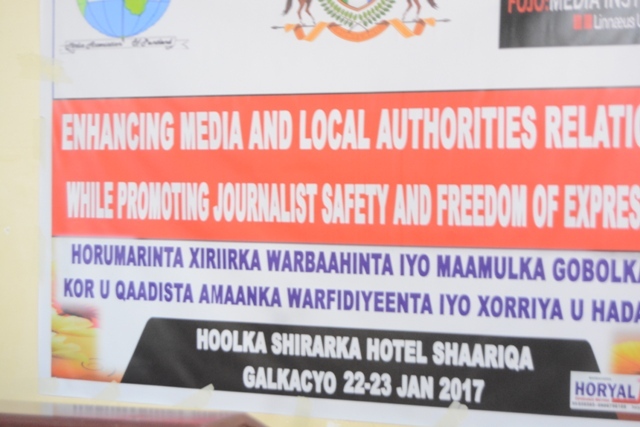 The two workshops arranged for 2-days each took place from 21 to 22 in Bosaso at the Ga’ayte Hotel whereas from 22 to 23 January 2017 held in Galkacyo at the Shaariqa hotel drew its curriculum from the UNESCO’s freedom of expression and public order training Manual and delved on international conventions and covenants on civil and political rights that include freedom of expression, press freedom and access to information. 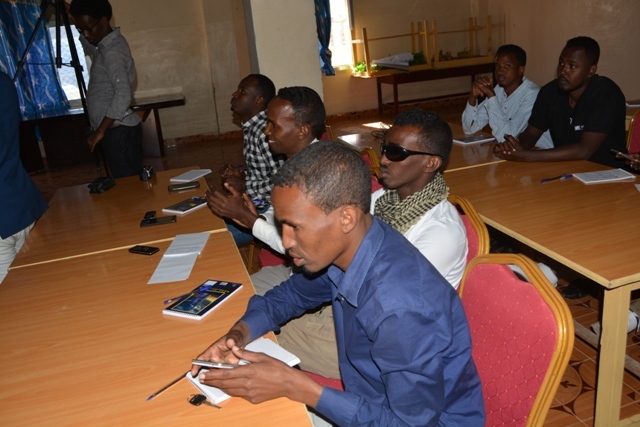 During the 4-days of training, subjects covered included security procedures in the field, the essential protection of journalists, ways to guarantee journalists access to the information they need, communicating with media, and freedom of expression. Other topics covered included Puntland media laws, state obligation on safety of journalists and protection of journalists, the UN Plan of Action on Safety of Journalists and the issue of impunity and good practices of fostering better relationship between the media, security personnel and the government. As of the workshop preparation, MAP engaged a legal consultant who reviewed a number of impunity cases on crimes against journalist in Puntland intended for the preparation of the workshops presentation. MAP chair in his opening speech welcomed the participants and reflected on the workshop’s objectives pointing out the central theme of the workshop being to improve the safety and protection of journalists in Bari region. He stressed that cooperation could only be achieved through building trust and transparency in relation to citizens, through the promotion of press freedom, and respect for the rule of law and public freedoms. The chair mentioned that this workshop supported by the IMS/FOJO institute will occur in Galkaio and Bosaso. While attending the launch of the Bosaso Advocacy training, Abdi hakim, Bari region Police commissioner applauded the timing of this training and said, “media has got an important role in the society that we all acknowledge and as of me I have had the privilege to work with the media friendly, he added yes a times cases occur and we need to fix that hopefully. Mudug Governor Mohamed Khalif Hassan on his inaugural remarks thanked the organizers and welcomed the workshop initiative ‘’It is important that we have such events which benefits both sides the media and authorities; at the end we are all serving the public, I hope we get a consensus on how we could improve the few errors’’ said Mudug governor. During the trainings a debated topic was the ‘’access of information’’ in which Media managers attending the event stressed that a major difficulty they faced was when they approached government offices it was a problem to either get the official they were seeking or a times they were confused on who was a relevant target to interview or rather seek an official news especially when it comes to sensitive matters that the public deserve to know. 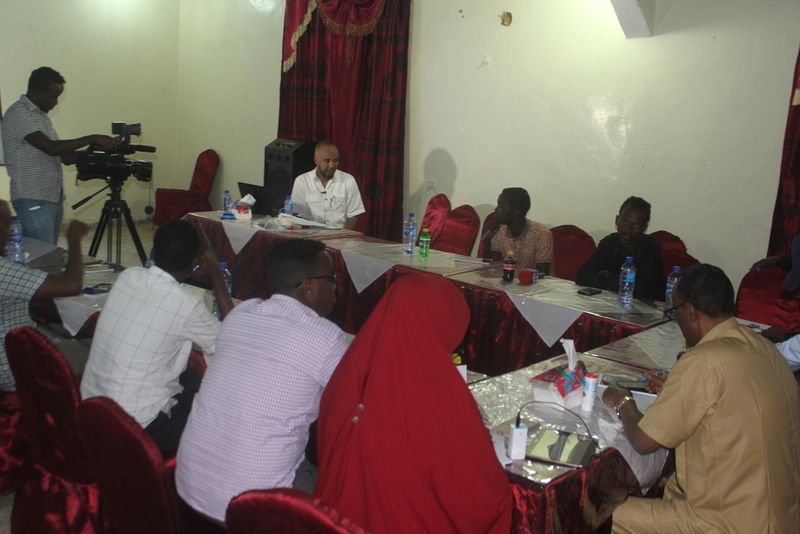 In both the Bosaso and Galkaio workshops, the officials pledged to ease the journalist access to information and facilitate the journalist work. Journalist also shared their stories while talking on situations in which the received death threats, warnings from unknown persons – very emotional stories were courageously shared with the government officials – Journalists also mentioned that they had no confidence on the police to report their cases, due to how previously cases were handled. 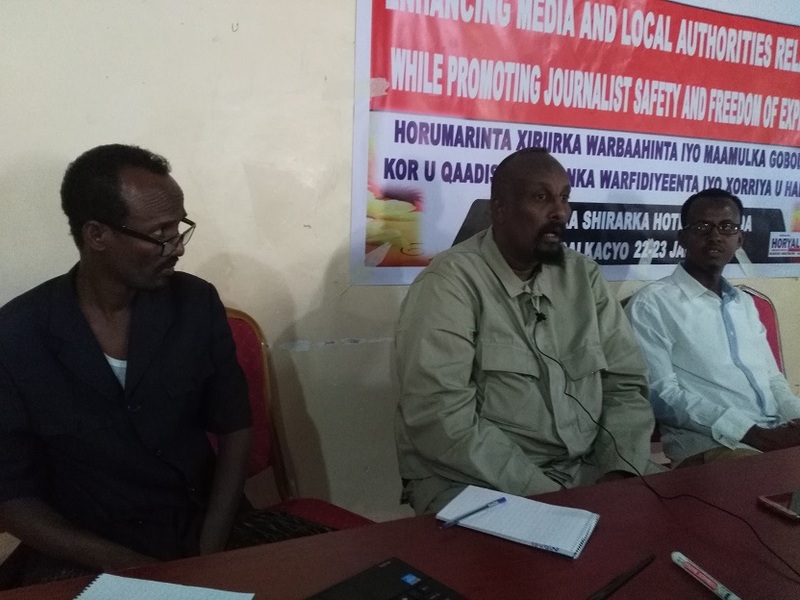 Authorities acknowledged the journalists’ testimonies and apologized for the lame actions that has put them not to have confidence – as a result – Both the Police commissioners of Mudug and Bari regions have pledged to assign special police officers in which journalists could file their complaints and case sensitive cases. The MAP’s engaged legal consultant on his legal review partly concluded that ‘’There are no doubts that authorities have taken aggressive acts against free media practice in Puntland with serious violations of freedom of expression in Puntland, including harassment, intimidation arbitrary arrests and detention, of journalists and media workers, police raid on radio stations, banning of radio stations were rampant in 2015 and 2016 in Puntland, adding, government officials have used excessive force against journalist in duty while using their political weight to influence the law enforcement. Journalists and media workers were arrested without warrants of arrest and later released without charge. 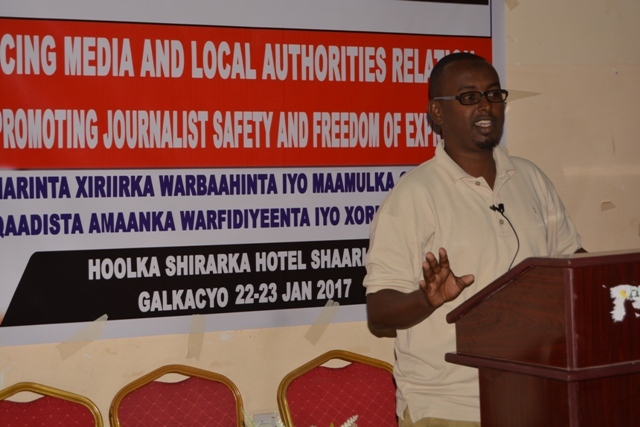 The cases studied also reflected on the limitations in the national security capacities for monitoring and investigating crimes related to media and limited law enforcement capacity, which is so low that journalists and the rest of the Puntland people in emergency situations have no known hotline to report threats to their safety. The security and law enforcement limitations and restrictions have heavily restricted the delivery of public services by journalists in Puntland. Perpetrators of these crimes against journalist are not limited to the terrorists; they include business organizations and the government. An important conclusion in the legal review on case studies revealed that in most cases, law enforcers were not familiar or do not understand the role and contribution of the media and journalists in development of the state. This has led to high levels of media censorship, increased self-censorship by the journalists in Puntland. 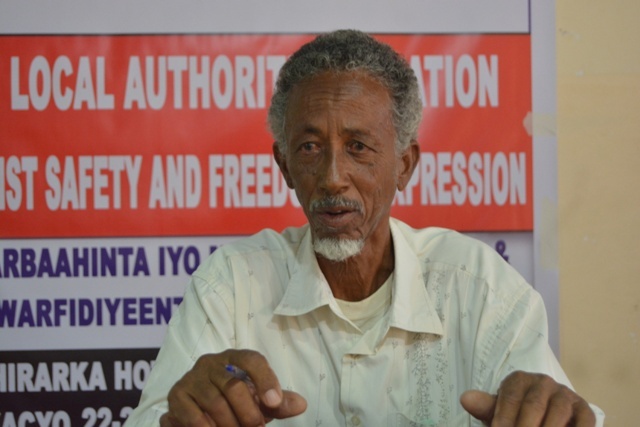 All these crimes have been in gross violation of the declaration of human rights and press freedoms enshrined in both the Somalia Federal Constitution Article 18 (1) and (2), Every person has the right to have and express their opinions and to receive and impart their opinion, information and ideas in any way. And in the Puntland constitution article 25 of the Puntland State Constitution. MAP considers capacity building of the security personnel of great importance because in Puntland and Somalia at large, the relationship between the law enforcers and journalists/media workers is often bad and limits access to information, hence the freedom of expression by journalists. 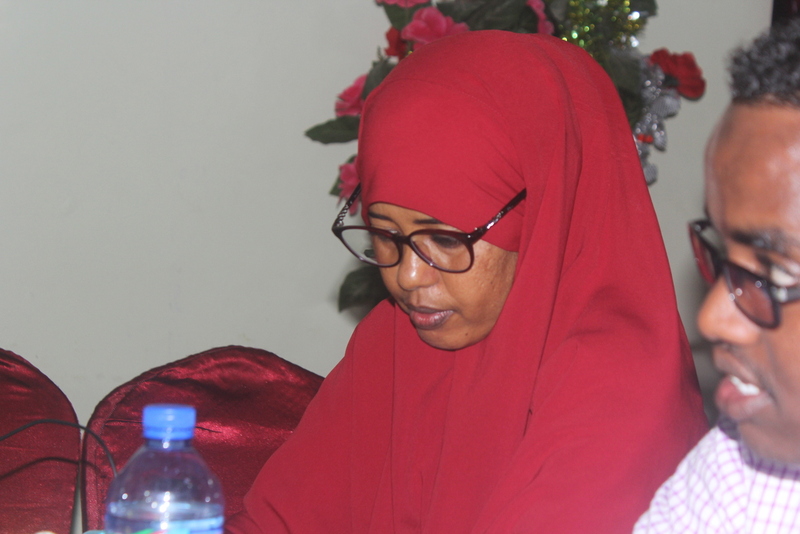 ”we are thankful to MAP for organizing such a vital meeting, we expect the government to fulfill in its pledges made in this meeting” Said the Bosaso Voice of America correspondent Fatuma Yaasin at her closing remarks of the Bosaso workshop. At the closing ceremony, speakers stressed the importance of addressing the specific security risks and the instantaneous need for the Puntland law enforcement to designate specific officers prepared to handle case – sensitive cases especially when journalists encounter serious situations like life-threats and investigation on Journalists killings cases is of a high priority. •Law enforcement will appoint special representatives to handle Journalists sensitive cases and or when a journalist is in danger. •Law-enforcement will abide by the legal procedures in arresting and handling journalist cases. •Participating authorities pledged to ease and facilitate the Journalist and Media work while promoting an enabling environment for free media work. The representatives of the security forces in both the Galkacyo and Bosaso workshops, paid tribute to all fallen journalists who have died while exercising their profession by passing their heartfelt condolences. This emblematic gesture clearly reflected the renewed efforts and authorities pledge to protect Journalist safety and established between the members of the security forces and the media, crucial for the strengthening of Puntland democracy. 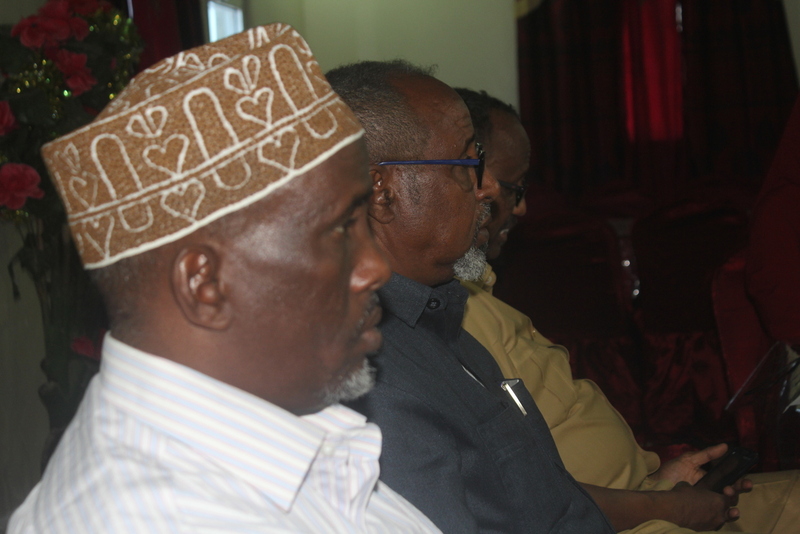 MAP through these meetings has called for the Puntland’s authorities to seek justice for the five deceased journalists. None of the perpetrators of the fallen journalists has been brought to justice, nor has the authorities carried out investigations.